So today, having splurged on a bunch of fancy lilies for a crafty photo shoot, I tidied my newly finished kitchen, staged it with lilies, and took a couple of pictures. Just for you guys! We tore down that ridiculous claustrophobic wall of appliances, opening the kitchen to the dining room. Big difference, eh? The cabinet color: dill pickle! Isn't that the best name? I hope you enjoyed this little peek. Can't wait to show you the crafty project for which I bought the lilies. Hint: it's a vase. Gorgeous! I love Mexican adobe homes. Whenever I see a renovation show that has a kitchen in that style they always rip it out. T^T Yours is so lovely. The colors are just beautiful. I ADORE the tile counter. I love it! That kitchen is so beautiful... and you did it all by yourselves! Congratulations!! Hey, Centi! Thanks so much! Yep, I am proud, like a mom who gave birth to a kitchen! the kitchen is adorable Mich - great job! I think the fridge looks rather elegant in there. 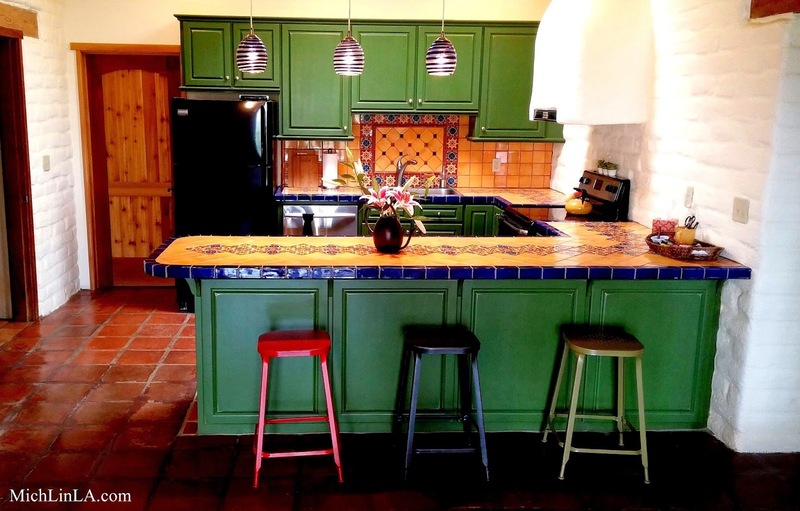 You could decoupage the cabinet doors if you have the strong urge to decoupage something, but I feel that a small painting print/artwork (maybe by an mexicanartists?) with yellow, green and pops of blue and red on the white wall (above your stationary supplies) could really tie the whole place together. Hola, Sandra! Graciassss! Lo de los banquitos fue totalmente un accidente. La tienda no tenia tres parecidos, asi que compramos los tres colores y me encanta el look. Como esta Matilde? Y tu? Perdoname los typos, no tengo accents, pero todavia estoy estudiando mi espanol. I love it! You did such a good job, and opening up the whole space makes all the difference. I couldn't help notice the charming wall too...and those stools. I love it!!! Such beautiful colors. 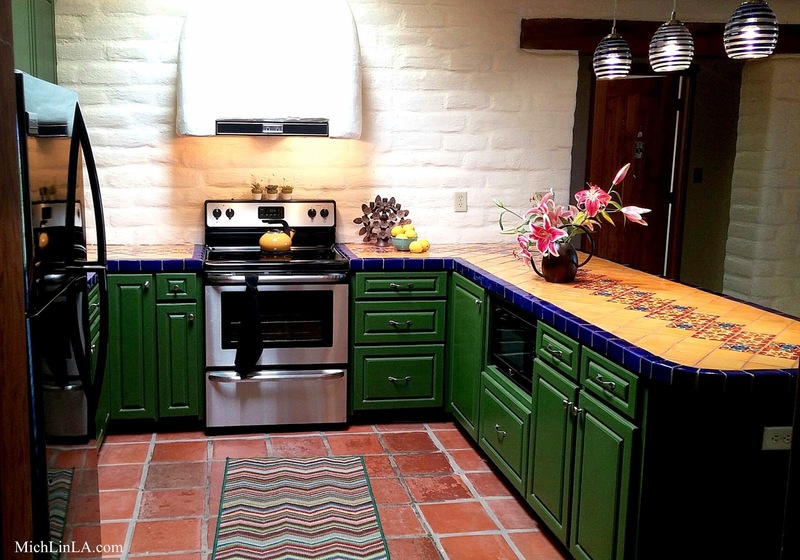 I actually like the plain fridge in there because too much color would take away from the lovely tiles, I think. Great job!!!! oooh, thanks, Shannon, so pleased you like it! You know what? I never looked at the fridge issue that way, but you are totally right. I shall now stop pining for a colored fridge. You are awesome. Your kitchen is fabulous! 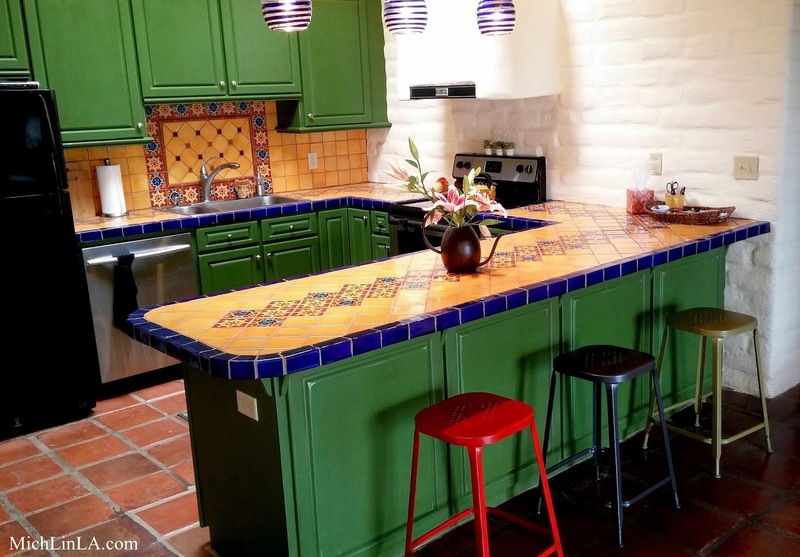 I love the tile work and the dill pickle cabinets!. Michelle, your kitchen looks amazing. And I'm very impressed you did it yourself! I can't wait to see what else you do with the adobe home. Thanks, Jessica! Really happy you like my mish-mash of color! I love your new kitchen, the dill pickle (one of my favorite snack foods-😂) color is perfect. Can't wait to see what else you do.